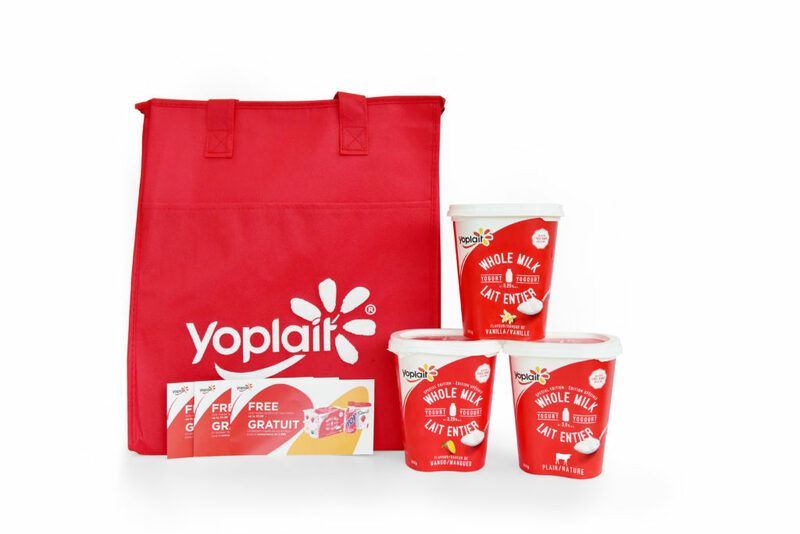 You are here: Home / Food / Try These Delicious Yoplait Whole Milk Yogurt Tubs + Giveaway! 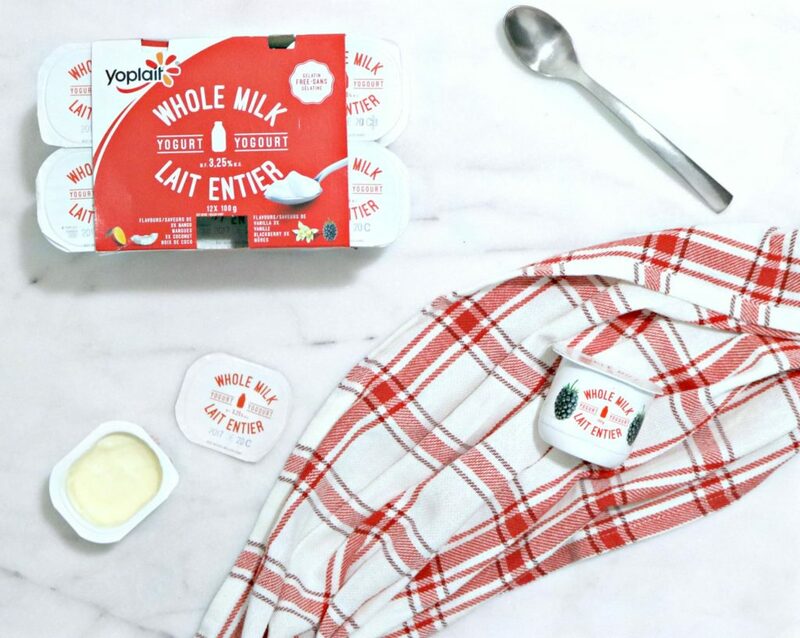 Try These Delicious Yoplait Whole Milk Yogurt Tubs + Giveaway! Yoplait Whole Milk Yogurt Tubs! One of our biggest responsibilities as parents is making sure our kids eat balanced meals. That includes the snacks that we choose in between meals too. That’s why one of our go-to snacks is yogurt and the kids absolutely love it. 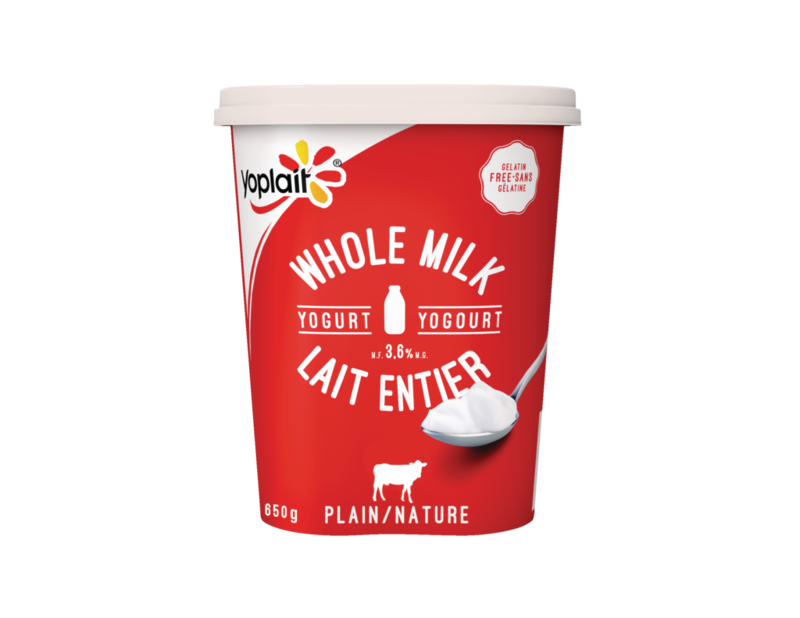 Yoplait has introduced Canada’s first Whole Milk yogurt and it is amazing! If you aren’t familiar with Yoplait, well, they’ve been in the yogurt game for over 40 years. Their yogurts and yogurt-based products are made with high-quality ingredients. Plus, they taste good and that’s always a plus for families with kids like us. The Yoplait Whole Milk yogurt tubs come in 3 different flavours such as limited-edition Mango, Vanilla and the new addition of Plain. It was hard to pick which one we loved the most. We have been trying to not only go back to eating better but, choosing products that don’t contain any unnecessary ingredients so you can feel good about enjoying it with the whole family.Yoplait Whole Milk yogurt contains no gelatin, no artificial colours or flavours, and no preservatives. To me, that’s feel-good ingredients and I have no problem letting my family enjoy it. Once the girls got into it, they couldn’t get enough. The yogurt doesn’t have concentrated fruit jelly at the bottom and I must admit, it is super creamy. It has fruity deliciousness in every spoon and is mixed perfectly. The tubs are great for us to make yogurt parfaits at home. So, we make it a point to have a couple on hand. This is a snack that the girls love to make themselves. They just have to scoop out the yogurt, add it to a cup or bowl, sprinkle or layer shaved almonds, chia seeds, chunks of dark chocolate, shaved coconut or fresh fruit and they just devour it. I find that their go-to for breakfast are parfaits. They aren’t big breakfast eaters so, a yogurt parfait gives them a great source of protein, fruit, and dairy. The multi-packs are also a portable option making them an excellent school snack that packs a nutritious punch. You can get the cups in strawberry, raspberry, blueberry, peach, vanilla, cherry, mango, coconut, and blackberry. I’m happy they enjoy the Yoplait Whole Milk yogurt so much. It helps us maintain a balance in their nutrition. Now that you’ve learned about this delicious yogurt, you gotta try it, right? 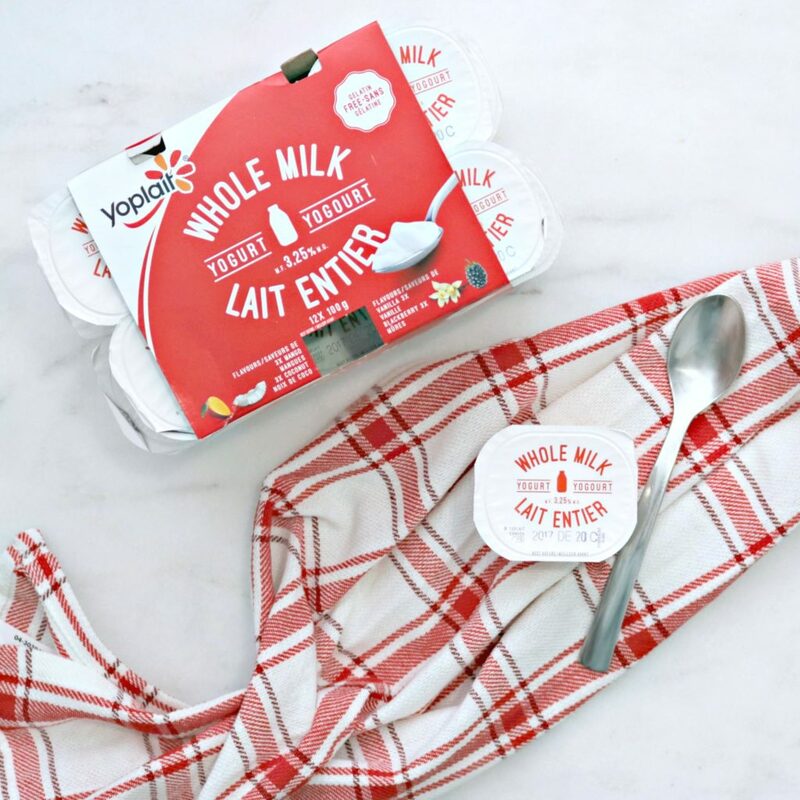 One lucky Whispered Inspirations reader will enter to WIN a Yoplait Whole Milk Yogurt Prize Pack! This contest opens on November 22 and closes on December 7 and open to Canada only. If you can’t wait to get your hands on this, you can go to your nearest grocer and it is available nationwide! For more information, visit Yoplait. Get social with them and follow them on Instagram and Facebook. Which flavour are you excited to try? Note: This post is sponsored by Yoplait. All thoughts and opinions are honest and my own. I love fresh berries on yogurt, and I sometimes put yogurt into my smoothies! I am all about whole milk products and tend to not eat yogurt because most is skim milk yogurt. 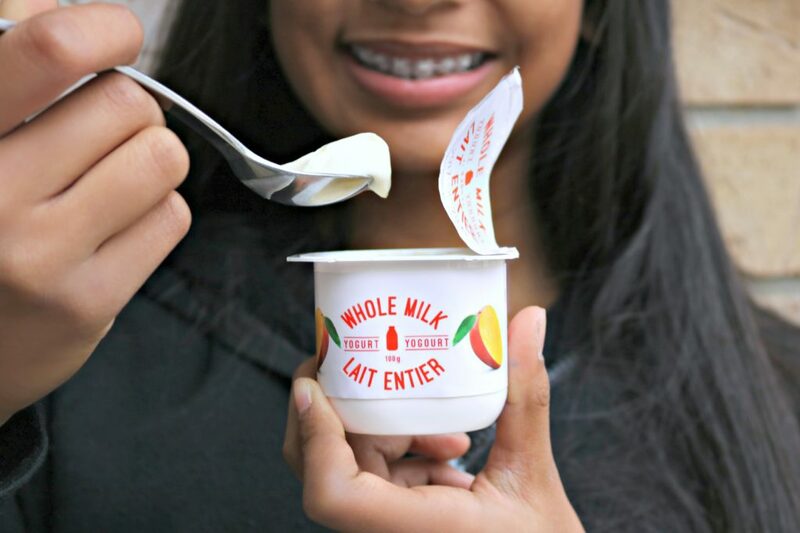 I totally have to try this new whole milk yogurt! So good, I hope you get to try it. Ranking the Yoplait flavours, my first choice would be the Peach, second Strawberry, tthird Blueberry & fourth Raspberry out of the Strawberry, Peach, Raspberry, Blueberry pack. I like to eat my yogurt with granola and frozen berries! I would love to try the coconut. I’ve been trying to eat more yogurt, particularly Greek. But I also love whole milk – have to try these! So good, you will love them! I would love to try the Vanilla. I would try the vanilla and add strawberries to it. I also make smoothies with the vanilla yogurt. I would love to try the Mango Vanilla! We like to make yogurt bowls with yogurt, fresh fruit and granola & seeds. I would like to try the cherry flavour. I eat my favourite cherry yogurt straight up. I most want to try the limited-edition Mango flavour! My favorite flavor right now is Coconut. Oh that’s Mango one sounds awesome! I’d likely pick up the plain and add my own fruit to it as well. It’s wild that I never questioned what percentage of milk is used in yogurt cups. Am happy to see that there is a whole milk option now, yay! I`d love to try the coconut yogurt the most! How can that not be delicious! I put granola on my cereal. Ohh now you have left me wanting some yoghurt! I bet this one is nice with a little jam mixed in! Yoghurt tubs make such a great on-the-go healthy snack. I love that this brand has no added preservatives or artificial flavours. I like vanilla flavoured yogurt the most. I would love to try the Cherry and the Strawberry ones first. I’d love to try Mango. I love both Vanilla and Mango yogurt. Mango would be the first. I would love to try the Coconut flavour. I would love to try the mango-flavoured yogourt. Sounds delish! Vanilla is always my preferred choice of yogurt. You can do so much with it. I personally enjoy blueberries or strawberries in mine. I want to try Mango! I would love to try Strawberry! I would try strawberry. It sounds so good. My favorite yogurt is mango but I love all the other flavors too. Nine times out of ten I will have a piece of fruit and a yogurt for breakfast so this would be awesome to win! Thaks so much for the chance. I would choose the raspberry flavor and I would it with my granola. I usually eat my yogurt with some granola and fresh fruit. I love vanilla myself, but the kids will love mango! I like to put some granola in my yogurt! I like to eat yogurt with fruit and granola. I like the plain yogurt. I eat it with walnuts and hemp seeds. I usually eat my yogurt straight up. I would love to try out the vanilla one. I love adding fresh fruit to my yogurt. I eat it all the time as a snack, or pack it in my lunches. Would love to try the vanilla with some fresh fruit. I’d love to try Mango! I sometimes add hemp hearts. i like my yogourt topped with granola and berries. I enjoy my yogurt with granola or any fruit in season. I think the vanilla would be great to try! I’d like to try out the peach. I would love to try the Coconut! I could use a little tropical in my life! I want to try mango flavor. I love to eat my yogurt with granola and fruit! Vanilla would be my choice. I would love to try Mango. I want to try the coconut yogurt! Love the pineapple coconut I love having mine with extra fruit cut up and sweet sugary syrups added . I like vanilla yogurt with cereal. Coconut would be a great choice. I want to try blueberry. I often mix chocolate chips into my yogurt, along with my strawberries or other fresh fruit. I like to eat my yogurt with a little bit of fruit. The mango is the flavour I would like to try most. I would like vanilla so I can add raspberries to it! I’d give mango a try first. I like my yogurt mixed with some granola and berries. I would like to try the mango, I like to add fruit or granola to my yogurt. I love adding chocolate chips into my yogurt. I think I’d go for the Mango first. I would like to try mango flavour. I usually eat my yogurt straight from the tub. I like adding granola or honey to my yogurt. I would like to try the peach one. I use plain yogurt in my chicken recipes.